And then he opened his mouth.Daemon is infuriating. Arrogant. Stab-worthy. We do not get along. At all. But when a stranger attacks me and Daemon literally freezes time with a wave of his hand, well, something... unexpected happens. Okay so let me start off with how much I love this book! This is the second time I've read it and I have to say that it was as good as I remembered. 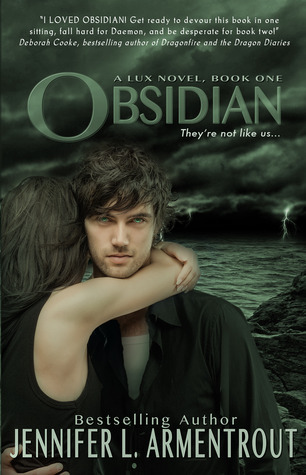 Jennifer had me falling in love with the characters all over again and I thought my fangirling heart was going to combust from how much it swelled with love for every interaction Katy had with Daemon and all the tension that flowed between them. Now, to the actual book xD Originally when I read this I was a bit skeptical because I never really did like alien books, but after reading it not one, but two times, I have to say that it's one of my favorites. Jennifer adds in a mix a seriousness and funniness that has you cracking up one minute and nearly sobbing or raging the next. It's an emotional roller coaster than I would gladly go on over and over again. After we get a glimpse of Daemon *fans self* (Btw I ain't cheating on Adrian with Daemon, but it's not like I don't have eyes XD) Katy meets Dee in FOOLAND and their new friendship starts. I personally love Dee. She's sweet and just so amazing that you can't help but love her. Later on in the series tho *scowls* but that's not important right at the moment XD Their friendship gets off to a great start...And then Daemon happens. So in order for Daemon to earn "Bonus Points" with his sister, he has to take Katy out to swim. Right off the bat, sexual tension sparks between them, and Katy just has to show him up by wearing a red bikini *rolls eyes* but that's not the thing that's most important. This is when Katy first starts to realize that something is just not right with the Black family. Okay, so fast forward past some friend days and some arguments between Katy and Daemon and you get to where Katy finally learns about them being aliens. So Katy finds out, but doesn't freak like Daemon believed she would, earning her bonus points in his eyes ;) The only problem is that now Katy has a trace on her. A trace is like a beacon to Arum, evil aliens, that lets them know Luxen are around. Now Katy must spend all of her time with Daemon >:) So much sexual tension!! I thought I would combust from them spending time together!!! Fast forwarding, Katy now knows most everything there is to know about Luxen and their world. But now an Arum is after her and Daemon for killing his brothers. Katy, bless her soul, won't let herself be a danger to Dee and the other Luxen. By this point, we all know that Daemon has feelings for her, but of course, Katy doesn't see that and charges off, leading the Arum away from the house. Throughout the whole battle between Katy, Daemon (yes he shows up to save her :D), and the Arum, I was freaking out. Daemon is one kickass Luxen, man. If he hadn't been distracted by Dee(who shows up -.-) and by Katy and wanting to make sure they were safe, he most likely would have defeated the Arum single-handedly. But Dee gets hurt and lays dying and then Katy isn't in any better shape due to all the hurt the Arum gave her before Daemon managed to find her. But one small distraction and Daemon lay there beside Katy, injured and near dying as well. Now I'm sobbing because they can't die and I can't believe Jennifer would put us through this kind of pain, but then the unexpected happens. Katy joins hands with Dee and Daemon and somehow manages to kill the Arum that's trying to kill all three of them. It doesn't make any sense, there is no plausible explanation for how she did it, but she some how managed to tap into the Luxen powers. This does not, however, stop Katy from dying :( Dee and Daemon are okay and they start gaining strength, but Katy...she's still laying there dying from how much trauma she had been put through. Dee runs to get Adam, another Luxen that is amazing at healing, but Daemon stays. He does something that no Luxen, as far as they know, has done before. He sheds his human skin and heals Katy more thoroughly than he had before. This somehow creates a bond between the two and it brings Katy back from the brink of death. Unfortunately, Katy is a stubborn person and doesn't believe that Daemon could ever have feelings for her with the way that he treated her when she first arrived to town.